Can You Build Good Muscles with Just Dumbbells? Your triceps, biceps and shoulder muscles are the major muscles of your upper arms. Depending on your goals and physical abilities, you can perform a variety of workouts with free weights, suspension cables, a cable column machine or your own body weight to strengthen these muscles. The National Academy of Sports Medicine, in a 2007 book by Michael Clark, recommends that you train on three non-consecutive days a week for five to six weeks to see significant results. A superset consists of exercising two muscle groups that work in opposition to each other, or using two opposing movement patterns, such as pulling and pushing, says physical therapist Gray Cook, author of "Athletic Body in Balance." This method helps you save time in your workout and improve muscle growth and stamina, which is ideal for bodybuilders and strength athletes. For example, you can perform one set of biceps dumbbell curls with a set of triceps dumbbell extensions while lying on a workout bench. Rest for no more than one minute between each superset, and repeat the workout twice more. Perform eight to 12 repetitions of each exercise in two or three supersets. Circuit training is a workout system in which you perform a series of exercises, usually between four and eight, that train different body parts and movement patterns without rest between exercises. 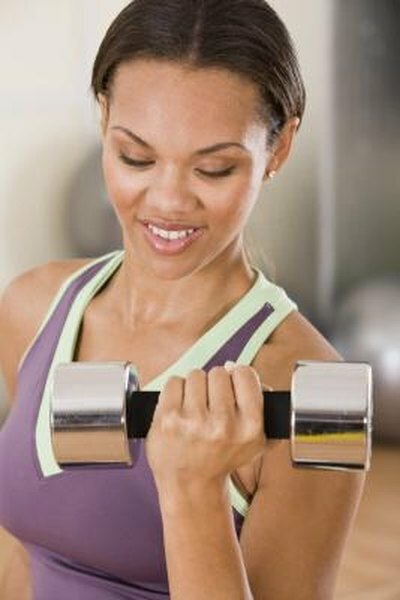 This improves muscular endurance and helps you burn more calories in less time. For example, you can perform the following exercises for your arms and shoulders for 30 seconds each: two-arm kettle bell swings, pushups, pullups, dumbbell curls, overhead presses and supine triceps extensions. When you have completed one circuit, rest for no more than one minute, then repeat the circuit twice. This advanced workout is similar to a superset, except that you perform one strength exercise followed by a power exercise that trains the muscle in a similar movement pattern. This method of training is ideal for athletes whose sports alternate short bouts of strength and power with periods of low-intensity activity, such as soccer or basketball. For example, you can perform a set of pushups followed by a set of medicine ball chest passes against a wall. Rest for no more than one minute between sets, then repeat the workout two or three times. Perform eight to 12 reps of the strength exercise and five to eight reps of the power exercise. Cook suggests that you first improve your lower-body strength before you work on your upper body, because strength and power are derived from your hips and legs. The strength you gain from working on your upper body does not make your lower body stronger. Therefore, you should incorporate lower-body exercises, such as squats, dead lifts, lunges, step-ups and jump-rope, into your arms-and-shoulder workout. Does a Jump Rope Make You Faster?